Few places on the Western Front held such a reputation as the Hohenzollern Redoubt. Attacked by the 9th (Scottish) Division at the start of the Battle of Loos on 25 September, the redoubt, jutting out into No Man’s Land was fiercely defended. It is perhaps most well known as the scene of the disastrous 46th (North Midland) Division’s attack on 13 October 1915. The losses to the 46th Division of 3,763 officers and men that day are greater than sustained in their failed attack at Gommecourt on the First Day of the Somme on 1 July 1916. Following the failure of this attack the line stabilised and the Hohenzollern Redoubt soon developed into a vicious mining sector as tunnelling operations reduced the landscape to a sea of huge mine craters. Modern map showing the Loos battlefield. Auchy-les-Mines can be seen south of the La Bassée canal. The Hohenzollern Redoubt was not far from the road passing Cité Magdagascar running to Vermelles. However, it is one event between the Scots’ initial attack and the 13 October endeavour that is the subject of this article. The Scots’ success in penetrating the German positions had been bought at a heavy price. Troops of the 26th Brigade had taken the Redoubt and pushed north to Fosse 8 and the Dump. German counter-attacks reversed these gain, pushing the Scots back to the eastern face of the Hohenzollern Redoubt by the end of following day. Severely depleted from their action, the Scots handed over their tenuous gains to the 28th Division, the positions being taken by units of the 85th Brigade. Fierce fighting continued for the next three days with German counter-attacks slowly and painfully retaking trenches. At the end of 30 September the British occupied the West Face of the Redoubt and Big Willie Trench. The Germans controlled most of Little Willie Trench, threatening the north flank of the Redoubt. On the night of 30 September/1 October 84th Brigade relieved 85th Brigade. German observation of this relief from the heights of the Dump was total and the new British occupants were subjected immediately to strong bombing attacks. The British held on – but only just. That night, they would attack to improve their hold on the German trenches. The plan was risky, involving no artillery bombardment. The attacking force captured parts of Little Willie Trench but could advance no further. German retaliation was swift; artillery subjected the Redoubt and Little Willie to regular and heavy trench mortar fire. A German bombing attack retook Little Willie Trench, followed by the loss of the Chord and West Face. Other than a small section of Big Willie Trench, the British were for the most part back in their original lines. The blood-soaked redoubt would have to be assaulted again. The 1st Battalion, King’s Own Yorkshire Light Infantry (83rd Brigade, 28th Division) had fought with great aplomb at Second Ypres. Prior to the Battle of Loos the battalion had been holding trenches on Messines Ridge. 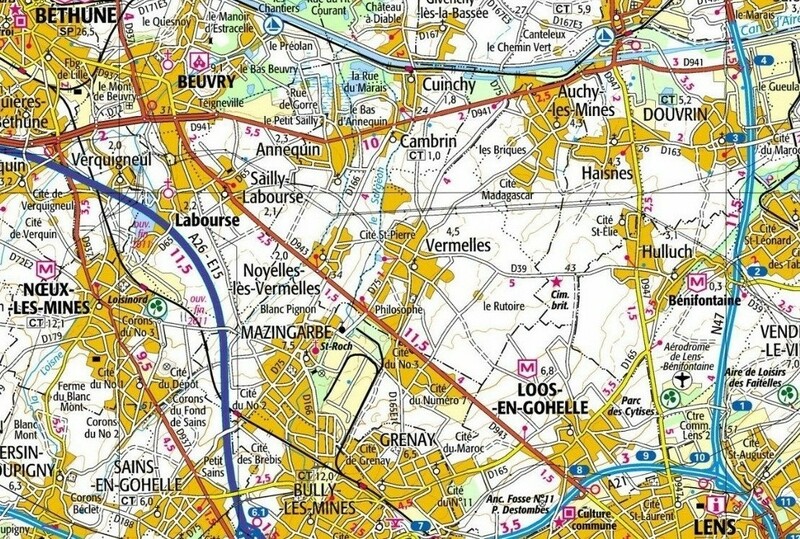 Their move south, via Bailleul and Outtersteene brought them to Noyelles les Vermelles on the afternoon of 27 September. The following afternoon they occupied reserve trenches on the Vermelles road as a bombardment was expected. After 90 minutes in position they returned to their billets in Noyelles. On the morning of 29 September the Battalion moved forward. B & C Companies occupied Sussex Trench whilst Battalion HQ and the remainder of the unit stayed in the Lancashire lines. In the afternoon B & D moved up to the line, D Company in the firing line in BIG WILLIE trench with B Company in support. Later that afternoon, the remainder of the Battalion moved up to the reserve trenches. Having taken twelve casualties the battalion were relieved the following day. They proceeded to the old British front line north of the Hulluch road, arriving there at 2.15am on 1 October. Three and a half hours later the Battalion were ordered to move up and occupy the old German front line trenches. Later that day they were relieved by 2nd Highland Light Infantry and proceeded to billets at Annequin. On the morning of 3 October the Battalion marched to Vermelles and then into trenches opposite the redoubt to relieve the 6th Welsh (84th Brigade). Trench map showing Hohenzollern Redoubt, The Dump and Fosse 8. British lines in blue, German lines in red. That night the C.O., Lt-Colonel C.R.I. Brooke DSO and Major Mallinson DSO went to Brigade HQ. An attack was to be made at 4.45am on 4 October by three battalions; the 1st KOYLI and 2nd East Yorkshires would attack the redoubt frontally, leaving the 2nd King’s Own to capture and consolidate Big Willie Trench. The optimistic plan depended on darkness providing the assaulting parties with the necessary element of surprise. Even then, the British would be advancing into a tumbled maze of trenches. The assaulting troops had no idea what they would be facing; there had been no time to reconnoitre the position. 4.45am – A & D attacked and were met with very heavy machine gun and rifle fire. There was no artillery bombardment. The distance to the German line was about 200 yards and the men got half way across. By then they were practically wiped out. (ii) Complete lack of element of surprise. The Germans were well prepared, and had not been in the slightest shaken by the desultory shelling that had taken place throughout the day. (iii) The Germans had been digging in during the day previous, and had thoroughly improved their trenches. (iv) The relief the day before did not finish until 7pm. Company officers had only very indistinct idea of the trenches they were occupying, and none at all of the positions they were to attack. So, when next at Vermelles, Auchy and the site of the Hohenzollern Redoubt give some thought not only to the Scots who attacked on 25 September 1915 and the North Midlanders (with two divisional memorials – one at Vermelles and one close to the redoubt) who fell is such number on 13 October but also to the men of the neglected 28th Division. In memory of 21865 Private George William Williams, 1st KOYLI. Killed 4 October 1915, buried Arras Road Cemetery, Roclincourt.